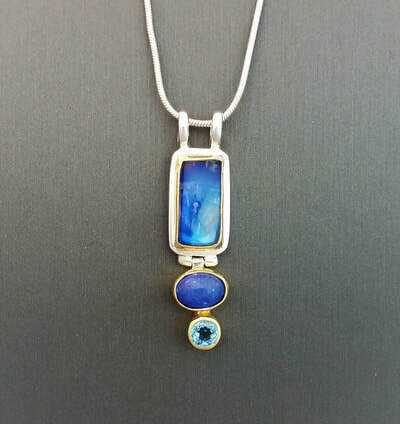 About JudithJudith Neugebauer has been a studio jeweler since 1974. Her distinctive use of 23k gold leaf and sterling silver has been her hallmark for 30 years. Prior to her career as a jeweler, she was trained in classical ballet, having studied extensively with the American Ballet Theater in NYC and New Jersey School of Ballet. She performed professionally in the Radio City Music Hall Ballet Company in NYC and with the New Jersey Ballet Company, as well as in Actors Equity musical theater productions throughout the country for ten years. The many years she spent as a dancer have given her an awareness of form, line and movement. 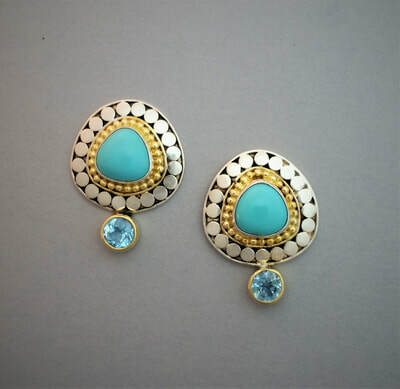 These influences have inspired her as an artist and have been transferred into her work as a jeweler. Additionally, her explorations with clay in the early 1980’s introduced her to an asian aesthetic, which may be seen in the calligraphic use of gold-leaf in her jewelry designs. Judith was educated at Farleigh Dickinson University in Madison, NJ and studied Jewelry at Kean University in Union, NJ. She also studied both jewelry and ceramics at Peters Valley School of Craft, Layton, NJ and the Visual Art Center of NJ in Summit NJ. She lives and works with her husband, Tom Neugebauer (a nationally known ceramics artist and sculptor), in Milford, PA.
Judith’s work is widely exhibited and collected, having been featured in Fine Craft Galleries, Museum Stores, and Juried Exhibitions throughout the US since 1985. She has served as a Juror for the American Crafts Council shows in 1996 and 2011, the Longs Park Art and Crafts Festival and has served as Juror for a number of other regional fine craft shows. She has also been featured in a number of national fine craft periodicals such as Ornament Magazine and Jewelry Artist Magazine. Each piece is made by hand in my studio using sterling silver with an overlay of 23K gold leaf. 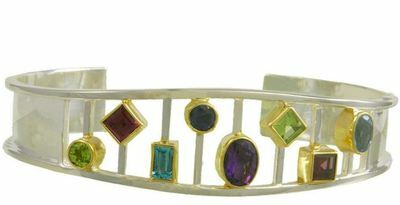 Many pieces also incorporate freshwater pearls and Australian boulder opals and various gemstones set in 22kt gold. My one of a kind pieces also incorporate the use of 18 karat gold. Fold-formed as well as die-formed hollow elements create visual depth, yet the overall concern with lightness and movement remain central to my approach. The addition of oxidized, sandblasted sterling silver on the surface creates a rich charcoal black patina which contrasts even more dramatically with the 23kt gold leaf; this is a popular finish I offer on most of the pieces in my collection.